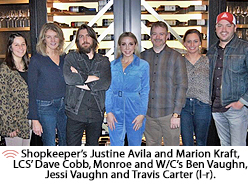 Warner Bros./WMN's Ashley Monroe has signed a worldwide publishing agreement with Low Country Sound and Warner/Chappell Music. Her cuts include Jason Aldean's No. 1 "The Truth" and Miranda Lambert's No. 1 "Heart Like Mine," as well as songs for artists including Vince Gill, Carrie Underwood, Dwight Yoakam, Norah Jones and Guy Clark.